Everybody loves steaks. Just at the mere thought of this delectable dish, your mouth is probably watering by now. If you already know the basic steps in preparing a New York steak right in your own kitchen, you will be able to enjoy this delicious main course for just a small amount of money compared to what you pay in restaurants. There’s no need to learn any secrets in preparing this. In fact, anybody can become skilled at cooking New York strip steak at home by simply following the instructions below to make sure that the outcome will be as perfect as the ones you can get from your favorite steakhouse. Preheat the oven to 325 degrees Celsius and preheat the cast iron skillet over high heat making it as hot as possible. The technique in cooking a real good New York strip steak is to hit the right balance between a juicy pink interior and a crusty sear on the outside. Use a little vegetable or canola oil to rub on your steak. Doing so will prevent the meat from sticking to the grill or pan and will ensure a proper sear. Use freshly ground black pepper and kosher salt on both sides to add flavor and spice up the meat. For about three to four minutes for every side, sear your steak on both sides until brown and nicely seared. Keep away from fiddling with the meat too much because it will cause the meat to be cooked unevenly and it will also stick. To finish cooking, transfer the meat to a 325 degree oven or indirect heat which cooks the meat more gently. Using the right temperature, allow the meat to cook until the proper doneness is achieved. Getting the doneness right is the most essential part in cooking you New York strip steak. 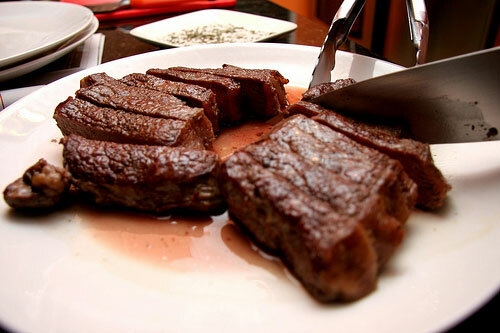 The best way of cooking beef is doing it medium rare which is about 126-132 degrees Fahrenheit. Plenty of juice and a little pink on the inside plus a perfectly good sear on the outside will be ensured by cooking the meat to medium rare. You can add sauce if you like. The meat will be savory on its own if you know how to properly cook a New York strip steak, there’s actually a very slight need for sauce. But if you prefer to have it with more flavor, feel free to sauce it up. Cumin is particularly great for steaks. You can add as many spices as you like but stay simple. To add more flavor to the meat, you can have the meat marinated first. However, this is not really a must since the meat is already tender enough. To ensure that all meat is evenly cooked, cut the meat to the same thickness if you are cooking several steaks at the same time.